COMMENTARY ON "The Unity of the Gospel"
This week’s lesson begins with a title that actually makes no sense at all. It establishes a false foundation that leads to a discussion about one of the most powerful passages in the New Testament demonstrating how Christians are to understand the work of Christ and the position of believers in Him. “The Unity of the Gospel” is a phrase which never appears in the Bible. Moreover, it actually makes no sense. The Gospel is an indivisible singularity. It cannot be split or “un-unified”. Moreover, people are not united by the gospel but by the work of the Holy Spirit. And he gave the apostles, the prophets, the evangelists, the shepherds and teachers,to equip the saints for the work of ministry, for building up the body of Christ, until we all attain to the unity of the faith and of the knowledge of the Son of God, to mature manhood, to the measure of the stature of the fullness of Christ, so that we may no longer be children, tossed to and fro by the waves and carried about by every wind of doctrine, by human cunning, by craftiness in deceitful schemes. Rather, speaking the truth in love, we are to grow up in every way into him who is the head, into Christ, from whom the whole body, joined and held together by every joint with which it is equipped, when each part is working properly, makes the body grow so that it builds itself up in love (Eph. 4:11-16). The “unity of the faith” is explained by the succeeding phrase, “and of the knowledge of the Son of God”. The “faith” of which Paul speaks is not a generalized idea of a person’s unique faith in whatever he believes. Rather, the “faith” of the New Testament is the faith in the Lord Jesus and the truth about Him and His finished work. Biblical “faith” is not a spiritual commitment or chosen religion. Rather, it is very specific: placing one’s trust and belief solely on the Lord Jesus. In fact, Paul says that the unity of the faith is accomplished in only one setting: the attaining of the knowledge of the Son of God. The lesson, however, does not refer to this biblical faith in Christ alone when it titles this lesson “The Unity of the Gospel”. The author actually means Adventist beliefs and practices when he writes “gospel”. Adventism does not teach the biblical gospel; this fact lays the foundation for a completely false teaching about the core issues in Galatians. This description does not match the words of Galatians. In Galatians 2:11-4, Paul is calling Peter out publicly for refusing to eat with gentile Christians after “certain men from James” came. First, Paul is not working on maintaining apostolic unity. He is reprimanding PUBLICLY his fellow apostle Peter, not for the sake of some interpersonal “unity” but for going in to pressure from false teachers, Judaizers who claimed to be believers but who were teaching “another gospel” that required the gentiles to be circumcised and keep the law. He and Peter WERE unified. They were both godly men and in no danger of breaking ranks. But Peter was being deceived and shamed into acting in opposition to the gospel. He was reverting to Mosaic law and refusing to eat with the gentiles even though they were believers. This slip back into the law was unacceptable and compromised the gospel. It was this anti-gospel behavior that Paul was correcting, not some personal action Peter exhibited because of a difference of opinion or response. The idea of “diversity within unity” is not an issue in Galatians. What is at issue is that gentiles and Jews who trust Jesus are equal, even if they have different backgrounds, and Jews must not marginalize gentiles by refusing to eat their food and share fellowship. Today’s lesson makes an artificial case for the importance of unity. 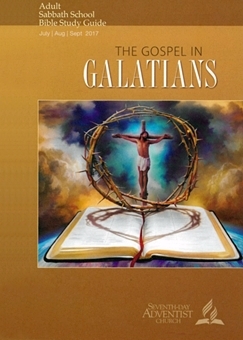 Galatians is not about unity among people; it is about guarding the purity of the gospel. The fact that the lesson diverts from the central point to discuss the politically correct social idea of “unity” is a red flag: Adventism cannot teach the actual lessons of Galatians without destroying its own theology. Galatians is not about unity; it is about honoring the gospel of the finished work of Jesus and of refusing to require law to be added to the completed work of Jesus’ death, burial, and resurrection. People, whether circumcised or uncircumcised, are called to trust Jesus and repent of their sins, receiving the payment of Jesus’ blood on their behalf. This is the central point of Galatians: God’s promises of sending a Redeemer is unfailing. His promises are not dependent in any way upon the law, and no teacher, not even an angel heaven (Gal. 1:8), is allowed to preach any other gospel. There is only ONE gospel. It is not able to be divided nor multiplied. It is a simple reality. Unity among people is NOT the point of this book. Moreover, in this book, Paul is treating those who oppose the gospel not as believers with a different viewpoint but as false teachers who must not be given any attention. Monday’s lesson completely misses the point of circumcision. Paul’s point about circumcision was not just about an isolated rite that was now outmoded. It was a rebuke of returning to the law. Gentiles Christians were NOT to be made to be circumcised, because being circumcised meant becoming a Jew and thus becoming subject to the whole law. The Jews understood circumcision to be about becoming Jewish. Circumcision, in fact, was the doorway to keeping the law. Without circumcision, the law was unavailable to the gentiles. It was only for Jews. The lesson is making the wrong conclusion. The truth is that the issue was not circumcision in a vacuum; rather, the issue was the law. The Jews believed the gentiles had to keep the laws of Moses in order to be saved, and Paul was arguing on the contrary. The law has no part in salvation. The lesson will not face this reality. Tuesday’s lesson is attempting to say that Peter, appointed to preach to the Jews, and Paul, appointed to preach to the gentiles, had the same gospel, but the methods of presentation differed. This notion is not in the biblical text at all. Of course God had called Paul and Peter to different people groups as their primary focus, but that fact isn’t what the conflict in Galatians was about. Rather, the conflict was over the fact that Peter removed himself from eating with the gentiles, and Paul publicly chastised him and Barnabas for that action. While it may be true that different people groups need different approaches, that fact is not what Galatians 2 is about. What is going on here is that Peter was to stay true to what God had revealed to him in Acts 10: gentiles were not unclean because God now called them clean. Moreover, gentile food was not unclean. Peter had been called to Cornelius’s house for several days, and going there, staying in his house, associating with him, eating with him—ALL of those things were forbidden by the Mosaic law. God informed Peter through the vision of the sheet with the unclean animals in it that all of those laws were not obsolete. He had to associate with gentiles and sleep in their beds, touch their furnishing, and eat with them of whatever food they served him. These things were what Paul was calling Peter to observe! He was dishonoring the gospel to pull back from the gentiles. Today’s lesson is the overt “turning point” at which the Adventist interpretation of Galatians become deceptive and untrue. The lesson states that some have assumed Peter and the other Jews had ceased following the Old Testament laws about clean and unclean foods. In fact, the author states that such “does not seem to be the case,” and makes the claim that if such a withdrawal from unclean foods had been the case, there would have been a huge uproar in the church, and we would have heard about it. In fact, there WAS such an uproar; it forever laid the standard for how gentiles converts were to be taught. That uproar was recorded in Acts 15. Acts 15 established without doubt or equivocation that gentiles were NOT to be required to keep the laws of Moses. Food WAS the issue! Again, Jews could not eat with gentiles not only because gentiles were unclean but because their foods were ritually unclean. In fact, God had forbidden the Jews to eat “unclean” foods in order to keep them separate from the gentiles. When Peter pulled away, he refused to eat the foods the gentiles ate. Acts 15 removed any requirements that the gentiles had to follow any laws from Moses—including the food laws. As long as Adventists refuse to deal with the fact that Paul is explaining in Galatians that the law must be replaced by the Lord Jesus, they will utterly miss the point of the book and the life and freedom of the gospel. Again in today’s lesson the author attempts to say that “judaizing” was about adopting “a Jewish way of life”. Deceptively, the author fails to acknowledge that a Jewish way of life depends upon the law. Paul is not concerned about marginalizing people because they have different practices and preferences; rather, he is publicly confronting Peter because he is practicing anti-gospel behavior. He is returning to the law in order to keep the shaming judaizers happy, and he is confusing the gentiles and confusing the gospel in their eyes. Paul’s point is not disunity among believers; his true concern is believers being sucked into deception and the sin of law-keeping when they have experienced the enlightenment of the gospel and the power of the Holy Spirit. When a person has been born again, the law has no more authority over him. He is answerable only to His Master, the Lord Jesus. Today’s lesson summarizes that the point of this part of Galatians was the conflict over circumcision and the subsequent idea that the uncircumcised were second class Christians. On the contrary, the issue in this lesson is the LAW. Those who return to the law, as Paul will say later in this book, have fallen from grace. The lesson attempts to make circumcision appear to be an elective, and optional practice that should not divide believers. The actual book of Galatians, however, is describing circumcision as placing the gentiles under the law of Moses, and this adherence to MOSES is what the Bible condemns. Paul’s chastisements were not about optional practices. He was, rather, stating that the law was over, and no Christian should or could be compelled to keep the Law. Copyright 2017 BibleStudiesForAdventists.com. All rights reserved. Revised July 7, 2017. This website is published by Life Assurance Ministries, Camp Verde, Arizona, USA, the publisher of Proclamation! Magazine. Contact email: BibleStudiesForAdventists@gmail.com.